Jim Bach: Silver prices this week dipped below $19 for the first time in three months, but the factors suppressing price gains in this current bear session have just about run their course. At market close yesterday (Thursday), the white metal was trading at $19.055 an ounce and even touched on $18.99 briefly. Silver prices were down $0.405 following the Labor Day weekend, a 2.1% decline. And on the year, silver has fallen $0.51, or 2.6%. Silver futures – contracts promising the delivery of silver on a set date at a determined price – closed at $19.14 an ounce yesterday, down 1.8% on the week and 1.9% on the year. There was further trouble in other silver investments. The iShares Silver Trust (NYSE Arca: SLV), the largest silver-backed exchange-traded fund (ETF), which holds physical silver bullion in London and New York vaults, was down 2.1% on the week, trading at $18.32 as of yesterday’s close. The ETFS Silver Trust (NYSE Arca: SIVR), a close substitute to SLV, has fallen 2% on the week as well. Even silver stocks weren’t immune to the silver market’s current malaise. Key silver mining companies saw their shares take a dive this week, with Pan American Silver Corp. (Nasdaq: PAAS) falling 6.4% and Silver Wheaton Corp. (NYSE: SLW) down 4.2%. It may seem like silver prices this week (and, by extension, other silver investments) are in the doldrums, but there is a light at the end of the tunnel. One of the most encouraging signals that silver is ready to reverse this downtrend is the activity of the big money investors. While ETFs shed 1.2 million ounces of physical silver in July, according to data from Thomson Reuters GFMS, as prices fell 2.8%, the story was much different in August. Prices fell 4.5% last month, but ETFs added 8.9 million ounces of the white metal to their holdings. To put that number in perspective, for the first seven months of 2014, ETFs netted only 6 million ounces in their portfolios. So what prompted this buying spree? Another encouraging sign for silver is that with prices so low, speculators are currently building up short contracts on the white metal in huge numbers. 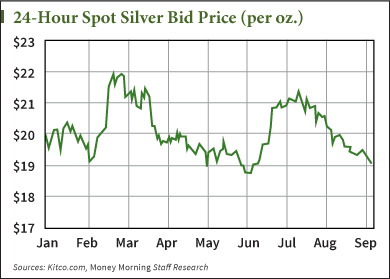 Now, here’s why the patterns in the 2014 futures market indicate that silver is due for some price gains. Short contracts promise the future delivery of physical silver at a price lower than where silver is trading at present. Speculators will stake out these short positions with the hopes that silver prices will decline and they’ll be able to buy back long positions on silver at a price lower than what they paid for the contract and pocket the difference. As these price speculators begin to build short positions on silver, it puts downward pressure on prices. Since July 29, when short contracts represented just 63 million ounces of silver underlying 12,603 contracts – the lowest number since February 2013 – the shorts have piled on. As of Aug. 26, the most recent data from the Commodity Futures Trading Commission shows that those contracts have built up to 158.2 million ounces, or 31,612 short contracts. But with prices coming ever closer to their yearly lows, the short buildup can only get so high before investors eyeing these cheap prices go long and put upward pressure on prices. This will then squeeze those speculators going short out of their positions, force them to buy long, and add a further jolt to soaring silver prices. This happened in June when silver was trading at $18.76, and short contracts reached 244.9 million ounces, the highest on record. A large-scale liquidation of short contracts helped boost silver prices 14.3% going into mid-July. Patient silver investors who didn’t flee the white metal because of the current price downdraft will soon be rewarded in a similar fashion. We’re in the midst of the greatest investing boom in almost 60 years. And rest assured – this boom is not about to end anytime soon. You see, the flattening of the world continues to spawn new markets worth trillions of dollars; new customers that measure in the billions; an insatiable global demand for basic resources that’s growing exponentially; and a technological revolution even in the most distant markets on the planet.And Money Morning is here to help investors profit handsomely on this seismic shift in the global economy. In fact, we believe this is where the only real fortunes will be made in the months and years to come.